The 3rd arc of the oft-delayed Astonishing X-Men series by Warren Ellis that has been split between the main series numbering and this off-shoot miniseries that started before the 2nd arc (Exogenetic) had even finished. This seems to be the last of the Ellis-helmed X-Men comics, but have the delays been worth it? Does, "sort of," suffice as a good answer? I sound critical of the series so far, and it hasn't been that great, but this issue finally does a good job of balancing story with action and delivering a political message about how people want to save the world, but don't care about a small village in Africa. 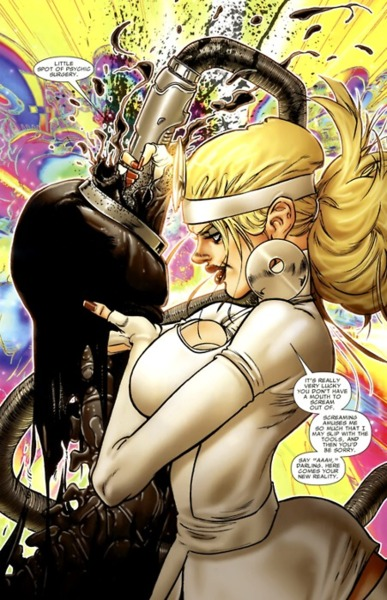 Also, Ellis does a really good job writing Emma Frost as shrewd-and-snarky character which other people seem to have trouble portraying her as, at least since Grant Morrison did such a great job (and Joss Whedon made an effort ). I genuinely liked this issue, but am disappointed it took until the last in the series for this to climb out of mediocrity into a somewhat fun state. 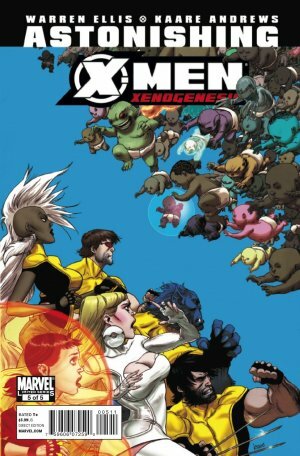 It'll probably read better in trade without the delays that seem to have plagued Ellis' work on Astonishing X-Men. As this seems to be the end of his work though I guess we won't be hearing more about these Ghost-Boxes he has been so keen on using in his stories. I read somewhere he originally was planned for four story arcs, so maybe in a perfect world this sub-plot would have bloomed further. We may never know.